I woke up this morning after having gotten about 5 hours of sleep, however, I’ve snoozed wildly for about two hours so I was in fact in real trouble. Crawling to the edge of the bed and forcing my legs over the side I happened to look at the clock which simply confirmed my creeping suspicions: I was late beyond repair and then some. Basically what you do is swapping consonants, nouns, vowels or even whole words. If there’s only one of them just switch its place. Don’t let things like word limits stop you, you can take a word like unseemly and turn it into suneemly as easily… Here are a few examples, I am sure you can come up with tons of more! Even though the baby-talk factor is pretty high, the purpose, if an exercise like this one needs a purpose, is to have fun until something like balking talkwards, or badding endly comes up. I am clumsy. I can only confess. But I still think what I did should not be possible to do. I mean, it’s not like having a foundation is optional when building a house… why should running exe-files as executables be an option? 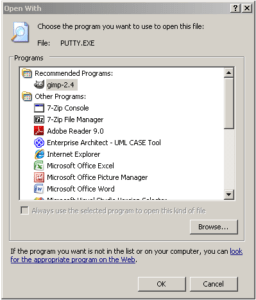 Okay, this is what I did: I have an exe-file (putty.exe) sitting on my windows start-menu (oh did I forgot to mention this was a problem in Windows? Sorry…) However, I happened to move the folder where this file was located. Not so good perhaps because now, of course, the link to putty fails. So, I right clicked it and selected properties, trying to figure out if there was a way to redirect the link. There was… kind of… there was the “Open With” button. I thought, hey, that could be it, let’s try it and see what happens. So I clicked it, opened it and selected putty.exe. It didn’t work. Or, well. Windows did what it thought I wanted it to do. The dialog I’ve quickly scanned before selecting a file was the dialog for reassociating the .exe extension … with putty.exe. This, however, was not in Windows liking, so now whenever I click an exe I get the dialog here to the left. It would have been really bad if I hadn’t done one good thing that day. I installed cygwin… and weehoo… windows programs can be started from cygwin. Phew! I can tell IT-support the problem is solved… almost! Since this is a “built-in” association it won’t be in the list of associations, we have to create it again (?!). Click “New” and in the new dialog enter “EXE” as the extension and from the drop down select “Application”. Don’t push any buttons! Without having to push any buttons, but with the kind mercy of the Gods of Windows, a message that the “EXE association has been changed” will appear along with a button to reset it to the default settings. Push the “reset”-button. You may have heard of the Large Hadron Collider or perhaps concerns about its safety, and if not you may still have come across this funny web page to test if it has destroyed the world yet. Children of Glory (2006) (IMDB, Amazon), or Szabadság, szerelem, as the original is named, is about Karcsi Szabó (Iván Fenyö), a member of the Hungarian Olympic water polo team. How he meets Viki Falk (Kata Dobó), falls in love with her, gets involved in the 1956 Hungarian revolution against the Soviet Union and finally goes to the Olympics to play the Soviet Union water polo team in what will become known as one of the bloodiest matches in the history of water polo. I’m all for Linux. Really. I love it, even though it’s from time to time a hate-love. However, I just realized one thing Linux has done to me that isn’t so good when you are forced to work and live in Windowsland. I’ve become totally naive when it comes to certain aspects of the Windows world. A couple of weeks ago I was looking for a program to help me keep my local hard drive synchronized (or in fact, backed up) to the network drive. A few factors have made this an issue for me, bad network performance but also the ability to just pick up your laptop and not worry about network connection to mention a few. Anyway, I browsed around, moderately annoyed trying to avoid all the $oftware in favor for something simple that could do the job but wouldn’t cost money… just like home in Linuxland, right? So I came a cross one really promising piece of software (no need to mention which since they’re not lone sinners :o), downloaded, tried it out and thought… hey this works! It had good integration with the desktop and a clean and simple UI and simple yet powerful features. Great. Then today I spoke with a colleague who had been on the same mission and told him this was good software. He was rather surprised, since he had long ago figured out the software was not at all free (even though it’s listed as free software on several places, and they say it is free). The surprise will come after 30 days when the software stops working, for all intents and purposes unless you pay them money. There are no such thing as a free lunch, not even in the Linux world, but there you pay with time, and your apps aren’t programmed to stop work after 30 days. They might, because you’ve downloaded beta software, but that’s because some one did not program, or program right, not because someone did. Anyway, I was baffled, totally unprepared and realized Linux naivized me! Wooh! Ever been turned down by a Windows machine over Remote Desktop because it already had too many connections? Where myhost.com is the name or ipnumber of the server you are trying to remote to. /F means a full screen connection, /console means to connect to the “console session of the server” (whatever that means, it anyhow results in you getting in although the server would otherwise refuse you). <Connection File> refers to an rdp file to be used with the connection (good if you need to make local drivers or other resources available or set up the connection otherwise). Finally you may also migrate files by using the “/migrate” switch (not 100% sure how this is done though since I don’t have an older version file to test with). Episode 7 of Stargate Atlantis season 5 starts on a foggy Gate World planet where two persons, apparently natives make their way through the fog. As they move on they come upon a sitting figure turned with her back at them. They approach and we can all see something bad is going to happen. One of them touch the figure who leaps on her feet, growling. Screaming, running and dying ensues and one of the scarier episodes of Stargate Atlantis starts. This episodes continues a theme development in Atlantis that at least I noticed already in previous episodes (not sure if it was in the Shrine or Ghost in the Machine I noticed it first…): The use of women not only as bosses or doctors (which to be honest is just a continuation of the age old matriarch and caretaker roles assigned to women). This time we see them as grunts. And although the episode had me biting my nails and turning down the volume (in preparation for the bang-crash- monster-attack- heart-attack sequence of events) none of the women came even close to the classic horror movie almost-naked-blond- running-screaming-through-the-forest- when-she-should-be-home- with-her-door-locked moves. This fresh and interesting episode only features Joe Flanigan from the permanent cast and I’m giving it an 4 out of 5. Its only demerits would be that it is a rather uncharacteristic Atlantis episode, and that the cast-dynamic suffers a bit from not having any of the other permanent cast members. Office 2007: Microsoft shoots itself in the foot? I have the somewhat dubious pleasure of working at a place where the migration from Office 2003 to 2007 is halfway done. Now, usually this should be no problem, but a couple of factors have cooperated to make it one. This leaves us with senders, running Office 2007, unable to tell if they saved the file in docx or doc format, and the recipients with Office 2003, unable to read these files. Even though there is an update, a lot of users aren’t comfortable with doing that… heck, I’m scared of doing unneccessary stuff to my wobbly M$ installation! The end result becomes pretty predictable: chaos, disillusioned users, and … a great day to start talking about OpenOffice.org? (even though it does not yet support the Office 2007 format). Working with closed source products (Microsoft Visual Studio, .NET, ASP.NET, SQL Server, and Oracle) while at the same time experimenting with open source products (Eclipse, Java, MySql, and Spring) I am constantly baffled by the persistence of closed source developers and business people in their handling of second grade support, bad information, and lacking products.